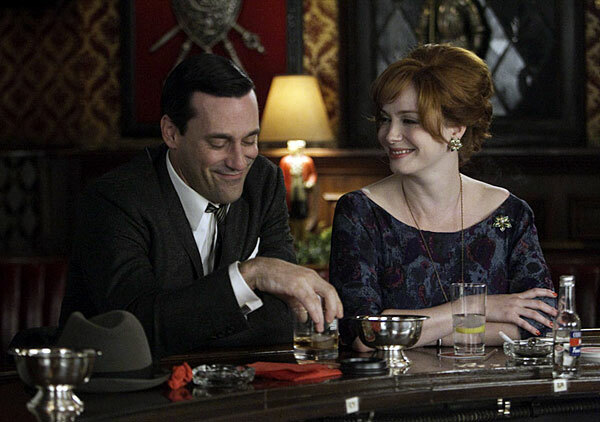 Mad Men‘s the best show on television right now (besides Breaking Bad), and “Christmas Waltz” was one of the strongest episodes this season. We got to see characters we haven’t heard from a while, such as Harry, and major stories for Pryce and Joan. Oh yeah, we also saw the return of Kinsey. The story followed a few arches. First, let’s start with Joan. Greg has finally divorced her, and to cheer her up, Don takes her to Jaguar to check the service and ends up picking up a car and driving to a bar, where Don tells her she’ll be happy about her divorce, reflecting Don’s own and how he married Megan. This made me think of an earlier where Joan states that Don cares more about looks than actual love. You can really pick it up in the bar scenes. Now on to Pryce. Out of all the characters, he seems the most moral. The moment where he beats up Pete remains the highlight of the season for me. So I was surprised to learn that Pryce actually owed about $8,000 to the British government. So Pryce pulls off a sneaky move. After discovering a surplus in money, Pryce takes out check, forges Don’s signature, and pays off his debts. It all seems well for Pryce until the others decide to forgo their bonuses after Mohawk goes on strike. But now onto the highlight of the episode, Harry. Paul Kinsey has come back and has now joined the Hare Krishna movement and has fallen in love with a woman named Lakshmi. Kinsey gives Harry a script he wrote for Star Trek, and asks him to read it and pitch it to NBC. I was expecting that Kinsey’s script would actually be really good and would actually be made into an episode. Unfortunately for him, that’s not the case. The script is bad, and Harry doesn’t know what to tell his friend. After Lakshmi tries to convince him to tell Kinsey his story is bad, Harry decides to be a good pal, and gives Kinsey a ticket to L.A. and follow his dream. Is Harry’s movement wise? In one sense, he’s freeing Kinsey from Lakshmi’s clutches. But in another, he’s letting Kinsey believe he actually has talent. So it wasn’t a very happy episode for the characters at Sterling Cooper Draper Pryce, except for the junior employees, who received bonuses. Pryce’s in trouble and Harry may or may not have made a really bad desicion. But it was a great episode of Mad Men overall, and I’m excited to see where the show’s going to go. This season has been absolutely spectacular. Last night’s episode was one of my favorites ever, I think. Yeah, it was great. I’ve heard positive things on the newest episode, which I hope to see soon. I’m glad I didn’t say anything to spoil it then. Try to avoid reading ANYTHING about it. There is a bit of a bombshell at the end.